"Global Express" redirects here. For the satellite network, see Inmarsat § Global Xpress. The Bombardier Global Express is a large cabin, 6,000 nmi / 11,100 km range business jet manufactured by Bombardier Aerospace. Announced in October 1991, it first flew on 13 October 1996 and received its type certification on 31 July 1998. Powered by two BMW-Rolls-Royce BR710s, it shares its fuselage cross section with the Canadair Challenger and Regional Jets with a new wing and tail. The shorter range Global 5000 is slightly smaller and the Global 6000 is updated and has been modified for military missions. The Global 5500/6500 with new Rolls-Royce Pearl engines with lower fuel burn and more range were unveiled in May 2018. The larger and stretched Global 7500/8000 have longer ranges. A Global BD-700 in a test flight. Bombardier Aerospace began studies in 1991 and the Global Express was announced on 28 October 1991 at the NBAA convention. Full-scale cabin mockup was exhibited at the NBAA convention in September 1992. Conceptual design started in early 1993 and the programme was launched on 20 December 1993. The aircraft high-speed configuration was frozen in June 1994 and the low-speed configuration was established in August 1994. The first flight occurred on 13 October 1996. After four prototypes flew 2,200 h, Canadian type certification was granted on 31 July 1998 before European and US approvals, and service entry in 1999. The aircraft is assembled at the Downsview Airport in Toronto. It is then flown for final completion to Montreal, Savannah, Georgia, or Cahokia, Illinois. The major external supplier is Japan's Mitsubishi Heavy Industries which builds the wing and centre fuselage sections at its Toronto facility. Bombardier subsidiaries have three specific roles in the project: Canadair is the design leader and manufactures the nose; Short Brothers in Belfast is responsible for the design and manufacture of the engine nacelles, horizontal stabiliser and forward fuselage; and de Havilland Canada builds the rear fuselage and vertical tail, and carries out final assembly. In 2015, Bombardier announced it would reduce production because of lower demand, caused by slowing economy and geopolitics in markets such as Latin America, Russia and China. The Global Express features a new supercritical airfoil with a 35° wing sweep and winglets. It is powered by two BMW-Rolls-Royce BR710 turbofans with FADEC. The flightdeck features a six screen Honeywell Primus 2000 XP EFIS suite. Turbulence is attenuated by the flexible wing. It shares its fuselage cross section with the Canadair CL-600 and Bombardier CRJ with a new T-tail. The Global is the business jet with the second largest cabin after the Gulfstream G650. It can accommodate 12 to 16 passengers in three cabin sections: mostly a forward four-chair club section, a central four-seat conference grouping and an aft three-place divan facing two chairs. Most have a forward galley, crew rest chair and crew lavatory. The 10.3-psi cabin pressurization maintains a 4,500-ft. cabin altitude up to FL 450 and 5,680 ft. at the FL 510 ceiling. It can fly intercontinental ranges without refuelling (e.g. New York City–Tokyo) or between most two points in the world with only one stop. In this class the Global Express competes with the Airbus Corporate Jet, Boeing Business Jet and Gulfstream G550/650. Mostly missions are 3.5 to 4.5 h long for 1,500 to 2,000 nmi, but can extend to 10 hr at Mach 0.85 (488 knots at ISA) or 12 h at Mach 0.82-0.83 (476 knots ISA), 13 h at most with clear weather at the destination and multiple alternates nearby. It burns 5,000 lb. of fuel for the first hour, 4,000 lb the second, 3,000 lb the third and 2,500 lb during the final hour. A checks come at 750 h intervals and C checks have been extended from 15 to 30 months in 2012. The average trip lengths for most operators is 2.5 hours where the aircraft will cruise between Mach 0.85 and Mach 0.89, making it one of the fastest long range jets available today. The maximum certified altitude is 51,000 ft (16,000 m) and the typical approach speed is 108 kn (200 km/h) requiring approximately 2,600 ft (790 m) of runway for landing. The Global Express (XRS) and Global 6000 type certificate designation is BD-700-1A10 while the Global 5000 is BD-700-1A11. 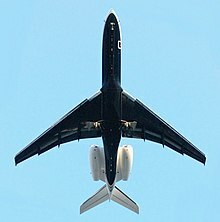 The Global 5000 was announced on 25 October 2001 and launched on 5 February 2002 with letters of intent for 15 aircraft with a 87,700 lb (39,800 kg) MTOW and a 4,800 nmi (8,900 km) range at Mach 0.85. The first aircraft flew on 7 March 2003. It was introduced in April 2005, and there were 224 in service in 2018. In April 2008, Bombardier lifted its MTOW to 92,500 lb (42,000 kg) to increase Mach .85 range to 5,200 nmi (9,600 km). Its cabin is 5.9 ft (1.8 m) shorter than the Global 6000 with a 5,800–7,000 lb (2,600–3,200 kg) lower MTOW depending on service bulletins, for a 5,000–5,400 nmi (9,300–10,000 km) range at LRC. The spec basic operating weight is 50,350 lb (22,840 kg) but are actually closer to 51,600 lb (23,400 kg). Early models kept the Global Express Honeywell Primus 2000XP avionics, updated with Rockwell Collins Fusion avionics since 2012. It can carry between eight and 19 passengers, the new seat converts to a full berth; there is an optional private room aft and the galley has room to prepare 16 five-course meals. It was priced at $40M in 2008, it has forward and aft lavatories, the crew rest area was removed, but could be restored. The tail fuel tank is removed and fuel is limited in the wings, some avionics are rearranged to gain usable cabin length and the interior completions allowance is 3,200 kg. At high-speed cruise, it burns 5,000 lb (2,300 kg) of fuel in the first hour, then 4,000 lb (1,800 kg) the second hour and 3,000 lb (1,400 kg) for the third hour. In 2018, Early models with Honeywell avionics are sold for $10-20 million, while post-2012 aircraft with the modern Cockpit can fetch $22-36 million. Major inspection every 180 months cost $800,000-1.2 million and two 8,000h engine overhauls can run $4 million. The cheaper and more efficient Gulfstream G450 or Falcon 900LX are slower, have less range and smaller cabins. The Global Express XRS was announced on 6 October 2003 during the NBAA Convention at Orlando, Florida. The Global 6000 offers higher cruise speed, increased range, improved cabin layout and lighting. The range increase is achieved by addition of a 1,486 lb (674 kg) fuel tank at the wing root. Bombardier claims it takes 15 minutes less to fuel the Global 6000 than the original model thanks to improved computer systems and mechanical refinements. The Global 6000 entered service in early 2012. Bombardier's Vision flight deck is equipped with Rockwell Collins Pro Line Fusion avionics from the Express/XRS Honeywell Primus 2000. It has improved acoustical insulation compared to its predecessor. By 2018, competition from the Gulfstream G650ER pressured it to a $40 million value from $62 million in 2016. On 27 May 2018, Bombardier unveiled the Global 5500 and 6500 developments expected to enter service at the end of 2019 with an optimized wing for a Mach 0.90 top speed, a revamped cabin inspired from the Global 7500 with its Nuage seat and updated Rolls-Royce BR710 Pearl engines with up to 13% lower fuel burn for better operating costs, better hot and high performance and 500 and 600 nmi (930 and 1,110 km) of additional range for 5,700 and 6,600 nmi (10,600 and 12,200 km), respectively. The engines have 9% more thrust, their certification was announced and are already test flying. The Global 5500 lists for $46 million while the Global 6500 lists for $56 million. By October, 70% of the flight testing hours were completed. 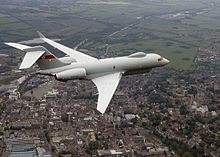 The programme involves two flight-test Global 6500s, as the 5500 is a simple 0.8 m (2 ft 7 in) shrink. The redesigned wings are built by Mitsubishi Heavy Industries. By December, the flight-test program was nearly three-quarters complete. The Global Express has been modified for military missions. Project Dolphin: Conversion of Global 6000 by Marshall into surveillance aircraft for United Arab Emirates. Two converted. 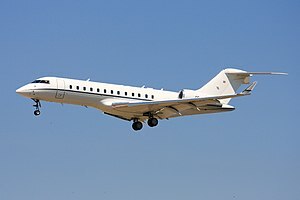 E-11A, United States Air Force designation for four Global 6000 being used as a platform for the Battlefield Airborne Communications Node. A BD-700 has also carried the High-Altitude Lidar Operational Experiment (HALOE) payload, deploying to Africa and Afghanistan to survey large areas rapidly. Most operators fly 450 to 600 h per year, but fleet operators fly more than 100 h per month. Half the 6000s are registered in North America, mostly in USA. NetJets operates at least six and large corporations like Aetna, Caterpillar, CitiGroup, Limited Brands, McDonald's and Texas Instruments fly the aircraft. Malta-based VistaJet operates six 6000s, along with five Global 5000 and two Global XRSs, and Lisbon-based NetJets Europe flies four 6000s. A dozen 6000s are registered in the Isle of Man for anonymity, a few are registered in the Cayman Islands. Four are registered in Austria, three in Switzerland, two in France and Denmark, and one each in Finland, Germany, Ireland and Turkey. Three are registered in China, one in Malaysia and one in Hong Kong. Two are based in São Paulo, two are in South Africa and one is in India. In February 2015, over 600 aircraft accumulated more than 1.5 million flight hours and 570,000 cycles. In May 2018, after 20 years, more than 750 Globals were in service. By October 2018, Bombardier had a backlog of 202 aircraft valued at C$14.1 billion ($11 billion), with 128 Globals including 67 Global 5000/6000 and four Global 5500/6500. One Global 5000 registered D2-ANG. Botswana Air Force - operates a single BD-700-1A10 for VIP transport. Turkish Air Force - Two received in March 2019, to be converted into jamming platforms. ^ a b Murdo Morrison (12 October 2018). "NBAA: Business jet designs that changed the industry". FlightGlobal. ^ a b Peter Henley (12 August 1998). "Business and pleasure". Flightglobal. ^ a b Allison Lampert (27 May 2018). "Bombardier launches longer-range variants of Global business jets". Reuters. ^ Graham Warwick (12 August 1998). "Global Express is certificated". Flightglobal. ^ "Bombardier in Ontario" (PDF). Bombardier. August 2016. ^ Kenneth I. Swartz (4 September 2018). "Wings to fly". Skies Mag. ^ Trautvetter, Chad (14 May 2015). "Global 5000/6000 Output Cut To Affect 1,750 Workers". Aviation International News. ^ a b c d e f Fred George (1 June 2014). "Bombardier Global 6000". Aviation Week Network. ^ "The fastest long range private jets available". Private Jets For Sale In South Africa. Retrieved 20 February 2016. ^ "Type certificate data sheet A.009 Bombardier Global BD-700". EASA. ^ Bombardier (2 February 2002). "Bombardier Aerospace launches Global 5000 business jet" (Press release). ^ "Bombardier Global 5000 successfully completes first flight" (Press release). Bombardier. 7 March 2003. ^ a b c Fred George (8 November 2018). "Global 5000: Best Cabin In 5,000-nm Transatlantic Dash Class". Business & Commercial Aviation. ^ "Global 5000 Adds Fuel and Range". Flying Magazine. 16 May 2008. ^ Tim Schwarz (19 July 2004). "Bombardier raises the bar". Flightglobal. ^ "Bombardier Global 5000 in the sweet spot". Flightglobal. 6 October 2008. ^ Aircraft Value News (26 November 2018). "Certification of Bombardier Global 7500 Puts Pressure on G650ER Values". ^ "Bombardier Grows its Global Family of Business Jets with Launch of Global 5500 and Global 6500 Aircraft" (Press release). Bombardier. 27 May 2018. ^ Ernest S. Arvai (27 May 2018). "Bombardier Launches Global 5500 and 6500 at EBACE". AirInsight. ^ "Bombardier Global 5500 and Global 6500 Business Jet Program on Schedule for Delivery in 2019, with Flight Testing 70% Complete" (Press release). Bombardier. 15 October 2018. ^ a b Edward Russell (15 October 2018). "NBAA: Bombardier on track for Global 6500 deliveries in 2019". Flightglobal. ^ Kerry Lynch (7 December 2018). "Bombardier Preps For 7500 Delivery 'In Coming Days'". AIN online. ^ "Saab GlobalEye in production". Air Forces Monthly. 10 May 2017. ^ Kwiatkowski, Mark (24 August 2018). "Picture: Project Dolphin surfaces with UAE air force markings". Flightglobal. Retrieved 26 August 2018. ^ "Swordfish Maritime Patrol Aircraft". Saab AB. ^ a b "Bringing Home the BACN to Front-Line Forces". Defense Industry Daily. 18 January 2018. ^ Arie Church (17 June 2011). "Air Force Prepares to Welcome E-11A". Air Force Magazine. ^ Butler, Amy (21 April 2014). "Intel Community Backs High-Res Imagery Push". Aviation Week & Space Technology. ^ "Bombardier Marks 10th Anniversary Of The First Global 5000 Delivery" (Press release). Bombardier. 21 April 2015. ^ Kerry Lynch (27 May 2018). "Bombardier Adds Pair of New Globals". AIN online. ^ "12 Things You Didn't Know About South African Millionaire Mark Shuttleworth". AFKInsider. 25 August 2016. Retrieved 15 November 2017. ^ "Botswana - Government Bombardier BD-700 Global Express photo by Malcolm Reid". airplane-pictures.net. Retrieved 1 May 2018. ^ "Bombardier Global 5000". luftwaffe.de. Retrieved 27 September 2018. ^ "Two Global 6000 jets delivered to Turkey for conversion into standoff jammers". Alert5. 18 March 2019. Archived from the original on 18 March 2019. Retrieved 18 March 2019. ^ Chuter, Andrew (23 February 2018). "First look: Saab unveils GlobalEye surveillance aircraft for the Middle East". Sightline Media Group. ^ "Global 5000 Factsheet". Bombardier. 2017. ^ "Global 5500 Factsheet". Bombardier. 2018. ^ "Global 6000 Factsheet". Bombardier. 2017. ^ "Global 6500 Factsheet". Bombardier. 2018. "Bombardier Global 5000 in the sweet spot". Flightglobal. 6 October 2008. Richard Aboulafia (April 2017). "Bombardier Challenger/Global Series" (PDF). Teal Group. "Flexing their wings". Aerospace Testing International. 18 July 2018. This page was last edited on 10 April 2019, at 13:29 (UTC).